Jerusalem, Dec 8 (Just News): Two Palestinians have been killed in clashes over US recognition of Jerusalem as Israel's capital, the Palestinian Health Ministry has said, after Hamas called for a "Day of Rage" in protest against Donald Trump's decision. Israeli soldiers shot the two men dead on Friday near the Gaza border, a health ministry official said in a statement, and the Red Cross said scores were wounded in clashes across the West Bank. The Israeli military said hundreds of Palestinians had rolled burning tyres and thrown rocks at soldiers across the Gaza border. "During the riots Israel Defence Forces (IDF) soldiers fired selectively towards two main instigators and hits were confirmed," an army statement said. The Trump administration's move to recognise Jerusalem as Israeli has angered Palestinians and sparking protests that stretched across the Muslim world on Friday, from Turkey to Indonesia. Speaking at the UN Security Council in New York, the UN Middle East envoy Nickolay Mladenov warned there was a risk of violent escalation after Mr Trump's Wednesday speech. "There is a serious risk today that we may see a chain of unilateral actions, which can only push us further away from achieving our shared goal of peace," he said. Various Palestinian groups, including militant organisation Hamas, had called for the protests to take place against the US and the Israeli occupation. An estimated 3,000 people marched, burned Israeli flags and stamped on posters of Mr Trump in around 30 protests across the Palestinian Territories. In Jerusalem itself, midday prayers ended with marches through the Old City. While there was some pushing and shoving as police broke up the crowds, the protests remained largely peaceful. Protesters chanted "Jerusalem is ours", "We don't need empty words, we need stones and Kalashnikovs" and "America is the head of the snake" as Friday prayers ended and worshippers made their way from the al Aqsa mosque to the walled Old City gates. 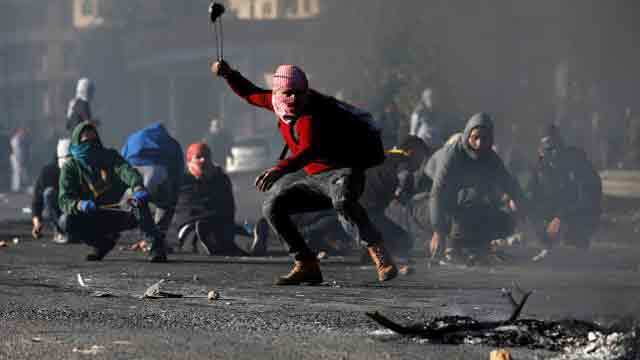 At least 13 people were injured by live fire and 47 by rubber bullets across the West Bank and Gaza throughout the day. Dozens more suffered from tear gas inhalation, Red Crescent paramedics said. Six arrests were made, the IDF said.